This issue has spawned such debate in my house that I feel compelled to write about my most recent experiences when I have tried to do the right thing and it has backfired. This post is about number three on that list, one and two now having to be put on the back burner so I can just figure out now what the hell to do about this one, my most immediate issue. When I started out a few days ago, I was certain someone with the corporate office would address the issue because it’s just bad advertising for them any way you look at it. After being belittled via email this morning for several hours by a realtor and consequently a broker she forwarded the email to, I am stunned to know this is perceived as acceptable behavior by grownups. Easily, they could have ignored me and said nothing. That didn’t happen. Another option would have been to decide to do something as human beings on the planet we share for no other reason than they are professionals in the region and maybe, just maybe, I would refer them out to any and all that I know for potential business opportunities. Alas, that did not happen either. What started at 7:42 AM this morning had ended at 10:19 AM where I have to reiterate, in a second request not to contact me again, that it’s against the stalking laws in this state to repeatedly harass someone in this state. She called me “unprofessional” because I dared contact another agent of the same company and office about an abandoned property. She called me “illogical” because I couldn’t possibly understand why she and the broker in that office didn’t care about this one bit. Well, Mindy, this one is for you. I contacted the corporate office regarding this property. Can someone in the office take a look at this? The grass is two feet high, kids are trying to break in and now there is a wrecked vehicle parked out front. By Oscar’s sign still being in the yard, it’s very bad advertising for you. I don’t know if it’s a foreclosure or an owner is involved but if someone could just clean it up it would help I am sure. I didn’t want to contact the police or the state if someone could just take the house over. Thanks. At this point, I am thinking she has read the previous correspondence with corporate, identifies an opportunity for herself if a realtor left the area abandoning houses and would want to generally make sure her office isn’t reflected upon poorly. See, my mistake today is assuming a lot of things. What proceeds from there is a repeated tirade of emails from her, then the broker she gets involved. At first, as she in every email continues to state “I don’t know how you got my information,” I give her credit for being slow and try to explain as slowly as I can how I came by choosing her. After the third time when she starts basically saying I am an idiot for contacting a realtor and not a broker in the first place (like I am supposed to know this automatically???) it dawns on me that she has not read one single thing I sent. She quickly evaluated that I did not want to buy one of her properties and wants me to bug off. She and the broker tell me not to “threaten them with the cops” which is hilarious because now two professionals are sending me emails like they are in some gang and they are going to bust my knee caps. I politely explained that it wasn’t a “threat” but merely I assumed (here I go again) that someone would ReMax would want to take care of the issue willingly, without me reporting them to the city or the state board. You are right. I am always first to be contacted on site cuz of Abbott. I get that! For every contact that does not pay, I get several that do, so it’s a numbers game all independent agents should grasp. She is an idiot – EVERYBODY who contacts me is a potential client, whether it be today or ten years from today. She needs a prospecting 101 class. As for the property – You did the right thing. It was uberkind of you, and absolutely understandable because it affects you and your family. Every county and city, if you are in city limits, has a manager, whom should be available through their website, who should take your email and had it to the right person. It is against city, county, state health codes to allow a property to go unattended. Maybe I am not losing my mind but I now have to file a complaint formally with the state, call several city offices and wonder what happened to courtesy and kindness in our country. I could go mow the grass but then what happens to the sign? I didn’t put it there and what if the ReMax gang sends someone to bust my knee caps when I touch their sign? This property does not border mine nor is it in front of my house but I still have to see it every day and it’s now attracting vandals in the form of ignorant teens. It does affect me, even if that office doesn’t care. My boyfriend, having spent several years dealing with the worst of humanity in all the places the Army can send you, thinks this solidifies his “keep your head down and don’t get involved” mentality. I have tried to raise my kids to be activists, to care when there is a wrong and seek to fix it. Huge dilemma in this house today. So, I pose a question to each of you, if this was happening on your street, how would you handle it? I'd have called the city first. Let ReMax accrue the tickets. Report it to the city, and inquire as to what the ordinances are pertaining to the upkeep of the lawn. 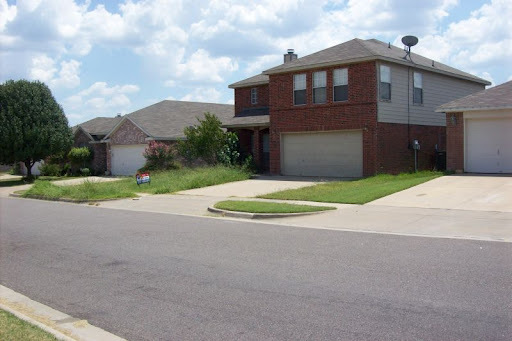 Generally, if a city has to mow the property, they will charge the service against the home, which may create a potential lien. You may also ask who the city inspector is for your area, and have them help you. You will get results! Thanks for all your help! I am armed with a whole new set of tasks for Monday morning. Hopefully, I will eventually bump into that one person that will feel obligated to help.